Will immigration reform really happen, and, if so, when? Answer: Yes. At least, Yes as much as Yes is possible in future US politics. Comprehensive immigration reform in the US has been proposed for years going back to then President Bush. Also immigration reform has passed the US Senate, but it has never passed the US House of Representatives. President Barack Obama has stated he will by-pass Congress and perform an executive action reforming the US Immigration system by the end of 2014. Also there further information exists that immigration reform is liely to happen within the next couple of weeks. Who will immigration reform benefit? Answer: The specifics of immigration reform are not known. However, it is expected immigration reform will especially benefit businesses who hire foreign workers, students in STEM (Science, Technology and Math fields) and foreign citizens currently in the US without status. Also in the past when potentil immigration reform have been proposed, a deadline has existed where a foreign citizen without status would need to prove having resided in the US (such as five years ago from a specific date) to qualify for immigration reform. That being said, leaked information on immigration reform that the Administration has not denied and in fact relatively confirmed largely provides benefits to immigrants out of status who either entered the US as children or have their own US Citizen or permanent resident children. Where are you able to mediate cases? Answer: Adam Edward Rothwell is able to act as a neutral mediator to assist in facilitating an agreement for adverse parties in Maryland, throughout the US and internationally. 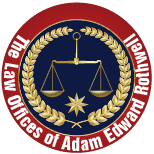 Please contact The Law Offices of Adam Edward Rothwell at either 410-662-8555 or info@usailc.com to discuss services of Mr. Rothwell as a mediator. When should a business and/or organization be concerned about legal compliance? Answer: Business and organizations have many issues, concerns and expenses to deal with on an ongoing basis. For these reasons legal compliance is understandbly often either an afterthought or no thought until issues arise. Still an ounce of prevention is really worth a pound of cure, which means legal complaince should be an ongoing concern for both large and small entities. By assuring legal compliance proactively, businesses and organizations limit potential risk, stress and financial hardship in the future.